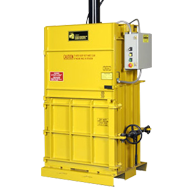 The M-30 HD is a high density mini-baler which is used to bale a wide variety of recyclable materials including cardboard, clothing, metal cans, and plastic bottles to a higher density than the M-30 STD. It generates over 41,300 pounds of baling force and makes bales of cardboard up to 245 pounds. The Ver-tech M-30 HD is a high density mini-baler designed for businesses needing to make very dense bales of a wide variety of materials. With its high platen force and 4 tie slots, the M-30 HD makes solid bales even of difficult materials such as steel cans or plastic detergent bottles. Bales of cardboard boxes, office paper, plastic film, rags and other baleable materials from the M-30 HD are as dense or even denser than those made by many larger "mill-size" balers. The M-30 HD requires only 29" x 46" of floor space and operates under an 8' ceiling. 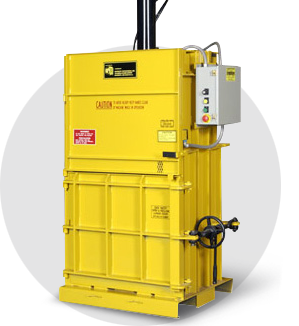 It can be moved with an ordinary pallet jack or equipped with casters for full portability, making it easy to locate the baler where scrap is generated. For small to moderate volume applications, the M-30 HD is the most powerful and efficient 30" baler on the market today. • Cardboard Bale Weight - 245 lbs. • HDPE Bale Weight - 190 lbs. • PET Bale Weight - 145 lbs. • Steel Cans Bale Weight - 220 lbs.